Planting with Pitchers — Aslan Brewing Co.
Aslan Brewing Co. is partnering with the National Forest Foundation to combat deforestation! "From urbanites in big cities to families in rural towns, we are all connected to our forests. But our forests need help. Natural disasters such as wildfire, insects and disease outbreaks are jeopardizing the very things that make our forests so wonderful, the majestic trees that grow from Maine to California. That’s why the National Forest Foundation is undertaking an ambitious effort to plant 50 million trees across our National Forests by 2023." Aslan will donate $1 for every pitcher of Classic Light Lager sold here at the brewpub. For each $1 donated the NFF will also plant one native tree in a National Forest. The NFF will direct your donation to the areas of greatest need in our National Forest System. Many of our reforestation projects occur in the western U.S. where there is an outstanding reforestation need. Donations will be pooled with others’ support to fund these projects. Drink beer, save the forests! 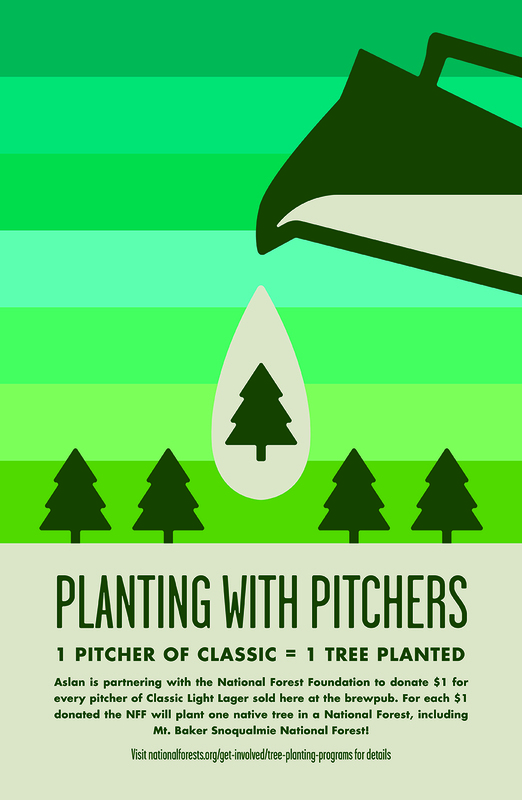 Check out nationalforests.org/get-involved/tree-planting-programs for details on the project!